The Cayman Aggressor IV, a liveaboard dive boat, promises scuba divers a weeklong Cayman Island vacation adventure exploring Grand Cayman’s dramatic walls and shipwrecks. It’s not the cheapest vacation you will find, but you will soon see why this vacation package may be one you’ll be booking. Wind and weather permitting, divers will also visit Little Cayman and Cayman Brac, the two other islands that comprise the Cayman Islands’ territory in the Western Caribbean. The liveaboard experience begins every Saturday afternoon when you first board the dive boat in the Cayman Islands’ capital of George Town. You can explore the boat, get to know fellow passengers and crew, or simply relax. The dive deck opens the following morning and remains open through noon the following Friday. During the summer months, the air temperature in the Caymans averages 88°F (31°C), and the water temperature averages 82°F (28°C). In the cooler months of January and February, the air temperature averages 81°F (27°C), and the water temperature averages 78°F (26°C). Most scuba divers wear 1.5mm to 3.0mm wetsuits. Divers can make up to five dives each day except for Friday when only two dives are permitted before the boat returns to George Town. Dive depths average 20-110 feet (6-34m) with minimal currents. The Cayman Islands are suited for divers of all skill levels—beginners to advanced. Before making your first dive, all scuba divers must provide proof of certification to the boat’s divemaster. Scuba diving in the Caymans can be described as both dramatic and diverse. The islands are part of an underwater mountain range with shallow water, coral reef exploration suited for snorkelers and massive walls with sheer drops for scuba divers. Some walls drop thousands of feet into the blue depths just yards offshore. Richly-colored corals cover the walls of these underwater mountains, home to abundant marine life. Scuba divers visiting Bonnie’s Arch, a reef off the northwest coast of Grand Cayman, will enjoy photo and video opportunities at this coral arch replete with marine life. Numerous species of vibrantly colored Angelfish, Seahorses, and Channel Clinging Crab populate the crystalline waters. Trinity Caves, another popular site for diving and photo opportunities, is located on the reef’s edge and is marked by a large coral head. Divers start at the reef top in 40 feet (12m) of water and enjoy three twisting swim-throughs as they descend to 90 feet (27m). Along the way, Black Corals, Parrotfish, Blue Caribbean Tang, Caribbean Lobsters, and Chromis can be seen. Devil’s Grotto, located just outside George Town, has been described as one of the best dive sites ever visited. Whether snorkeling or scuba diving, guests will enjoy the grottos and the multitudes of marine life. With a maximum depth of about 45 feet (14m), divers can see Green Parrotfish, Snapper, Barracuda, and more as they make their way through the grotto. Stingray City is located on Grand Cayman’s north wall. Ranked as one of the top scuba dive sites in the world, divers can expect to see a variety of Stingrays, Spotted Eagle Rays, and various species of sea turtles. Additionally, hundreds of fish species and coral populate these clear waters. Stingray City, cited as the world’s most famous 12-foot (3.7m) dive, consists of shallow sandbars inside a natural channel passing through a coral reef. Southern Stingrays of the Whiptail Stingray family come to feed and congregate to the delight of divers and snorkelers alike who can freely interact with and touch them. Tarpon Alley is another popular dive site where divers can expect to see large schools of Tarpon. Divers will see a variety of Moray Eels and several species of turtles including Green Sea Turtles. Divers will also see important reef-building corals including Staghorn Coral and Elkhorn coral. In addition to diving all areas of Grand Cayman, scuba divers may also have the opportunity to dive the wreck of the Russian Brigadier Type II Class Frigate off Cayman Brac as well as the Bloody Bay Wall area of Little Cayman. The M/V Captain Keith Tibbets frigate was a 300-foot (91m), Cuban naval frigate built by the Russians and intentionally sunk off the northwest coast of Cayman Brac in 1996. This multi-level dive, which provides excellent photo opportunities, lets scuba divers view both the wreck and the numerous marine life species. At its shallowest, the frigate sits in about 55 feet (17m) of water with its deepest at 100 feet (30m). Bloody Bay Wall, with its diverse marine life, provides an exceptional underwater scene. Its ledge starts at a depth of 20 feet (6m) and drops to a 6,000-foot (1,829m) vertical cliff adorned with Yellow Tube Sponges, Red Rope Sponges, and various species of Gorgonians known as Sea Fans. Caverns, small caves, and crevices hide an array of marine life along this magnificent wall. 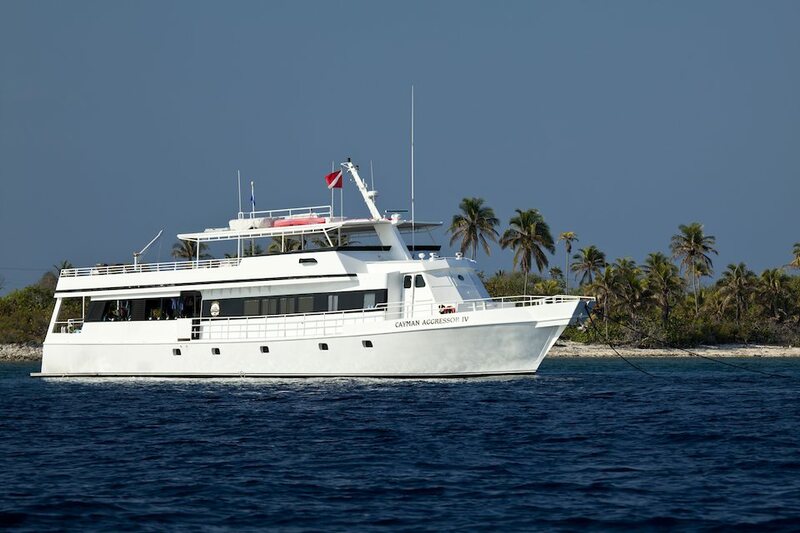 When not diving, guests will be able to go ashore for snorkeling and beach combing adventures. The Aggressor Fleet strives to provide scuba divers and guests with the highest quality and most innovative liveaboard experience possible. 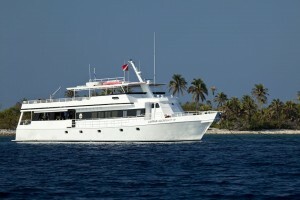 Their dive boats afford guests both safety and comfort as they travel to the best diving locations around the world.